The working Clumber Spaniel is a decidedly different animal from it’s hefty and rather lumbering show cousins. There has been a real ‘come-back’ in recent years of these splendid working dogs. Largely thanks to the dedication of enthusiasts like Debbie and John Zurick of Sedgehurst Clumbers. 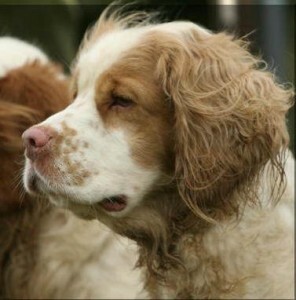 Clumber Spaniels are now being bred with genuine hunting and retrieving ability. Careful breeding has produced a spaniel that has the tighter eyes needed to cope with working in cover, much improved hips, and an excellent trainable temperament. Clumber Spaniels have been involved in shooting in Britain for more than 200 years. The breed’s name is derived from Clumber Park. Sent there apparently by a condemned french aristocrat. Check out Debbie Zurick’s article on the Gundog Club website for more information. Their decline in popularity led the Clumber to become vulnerable, but the efforts of working Clumber enthusiasts in recent years has given the breed a future. Clumber spaniels are the biggest of all spaniels, long with a heavier body build. Weighing in at between 45 and 65lbs, with males being the heavier, these are solid dogs but should never be fat or clumsy in appearance. The Working Clumber society have an informative website with plenty of information about the breed and links to breeders and trainers. If you are looking for an unusual and interesting breed of spaniel to join you in the shooting field, this is an excellent place to start. It’s a very good article about the work that has been done about the Working Clumber Spaniel getting it back to what it was in the Victorian times and make it once again fit for purpose. However it is a real shame that it does not explain that it has been more than one kennel that has been involved in this good work and credit should also be given to other members of the Working Clumber Society that have also worked hard to get this wonderful dog back to being able to do a full day’s work in the shooting field and continue to do so. Hi Graham, thanks for your comment. You are very welcome to add details of any Clumber enthusiasts that you think deserve a special mention.